A close up of the fillets on the Tiny Pterodactyl. 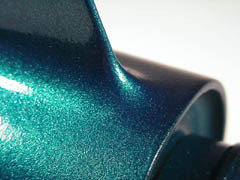 For more close ups of the finished finish project, skip to page 8. There must be a dozen different ways to get "perfect fillets, fins that melt into the airframe". Finding the technique or combination of techniques that's right for you is a matter of trial and error. When I first got in the hobby, I had a healthy respect (fear) of epoxy. I had no knowledge of additives and simply thought you mixed up something with a cure time close to what you needed to work with. I would "dam up" the leading and trailing edges of the fins, pour in the epoxy and hope for the best. The results were less than spectacular. The only way to do better, would be to take a more active role in mastering epoxy. Over the construction of three rockets, I perfected the following technique. It's very messy, and a lot of work, but the results are worth it. 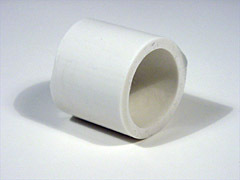 I use PVC Pipe to shape the fillets. A couple of feet of PVC pipe will provide you with enough material to last you a dozen rockets. 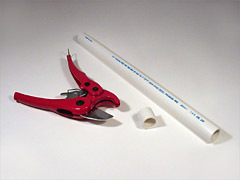 Why PVC pipe instead of popsicle sticks and tongue depressors? Better control over shaping the leading and trailing sections of the fillets. What length should the pvc pipe be? Technically, any length greater than the radius of the fillet should work. For me, a piece a little longer than the diameter works best. Longer segments, seem to pick up epoxy and carve ruts. They also require more paper towels and effort to keep clean. Wax them prior to each session and they're a lot easier to keep clean. During a session, you can keep the PVC pipe clean with a paper towel soaked in alcohol. Place the PVC pipe against the airframe and fins and mark off where it makes contact with the them. Mask the airframe and fins with blue masking tape.